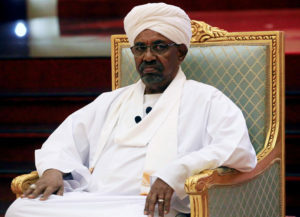 CAIRO — The Sudanese army will not extradite deposed President Omar al-Bashir but will put him on trial at home, before the nation, the military said Friday as it defended its ouster of the longtime ruler, saying it was in response to the demands of the people. Al-Bashir, wanted by the International Criminal Court, faces charges of war crimes, crimes against humanity and genocide for his deadly campaign against insurgents in Darfur. To hand over al-Bashir would be “an ugly mark on Sudan … even rebels carrying weapons, we won’t extradite them,” said Zein Abedeen, who has been tasked by the military to lead a political dialogue. The 75-year-old al-Bashir is in custody, Zein Abedeen said, but declined to provide more details or say where the president of 30 years is being held. He also confirmed that top government members, including the vice president and al-Bashir’s associates, are under arrest but didn’t give any names. “We came … to guide the country forward,” Zein Abedeen said, apparently trying to reassure Sudanese protesters holding a sit-in outside the military headquarters. The protesters have defied the military, which imposed a state of emergency and a nighttime curfew after it arrested al-Bashir. He pledged the military would stay on only as long as it’s needed, or for a maximum of two years. Thousands kept up their sit-in outside the Khartoum military headquarters overnight and into the morning, despite the curfew. Organizers said they would keep up the campaign and that they disagree with the army’s plans to rule the country for the next two years. Zein Abedeen did not indicate at the press conference that the army would move against the protesters, but made vague remarks how he would “come out … sit on the grass” and talk with the demonstrators. The mood among the crowd appeared festive Friday, with protesters playing music and chanting, “Down again” — a reference to Defense Minister Awad Mohammed Ibn Ouf who announced al-Bashir’s ouster on Thursday on Sudanese state TV. The rest of the council is yet to be announced. The Sudanese official news agency SUNA reported that Ibn Ouf postponed this step, pending “further consultations.” SUNA said Ibn Ouf would meet with political factions and leaders of the protest movement later in the day. In his televised announcement Thursday, Ibn Ouf said also that the military had suspended the constitution, dissolved the government, declared a three-month state of emergency and closed the country’s borders and airspace.